In view of China’s restless ambition – and American distraction – ASEAN ought to be taken more seriously by Australia, writes distinguished former diplomat Bruce Haigh. DONALD TRUMP has turned himself into a lame dog president. For the time being, the United States is of no use to Australia or anyone else. The internal battles to unseat the usurper will occupy Washington for the next two years and the U.S. economy will continue to lag. In the meantime, China will push to enhance what it regards as its natural sphere of influence — the South China Sea. But its ambitions extend further, it wants to dominate world trade and it wants greater influence over international affairs. It is playing its cards carefully, but playing them nonetheless, particularly in Africa, Pakistan and Sri Lanka. In view of China’s restless ambition – and American distraction – the Association of Southeast Asian Nations (ASEAN) ought to be taken more seriously by Australia. President Rodrigo Duterte of the Philippines has sought to play off China and the U.S. He has partly succeeded. He has held the U.S., but not entirely China, which pushed back. Nonetheless, they have promised aid for infrastructure, soft loans and fishing concessions. Chinese investment in the Philippines is burgeoning, particularly in the property sector. American investment is stagnant. Duterte hosted and chaired the 30th ASEAN Summit in Manila, 26-29 April, the theme of which was a rules-based, people oriented and centred ASEAN. 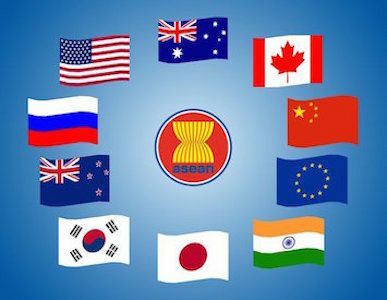 In the chairman’s statement, ASEAN leaders reaffirmed commitment to the peaceful settlement of disputes and 'full respect for legal and diplomatic processes', including respect for international laws. However, apparently after pressure from China, the chairman dropped the affirmation of respect from the section on the South China Sea. Existing guidelines for hotline communication were endorsed while a Code for Unplanned Encounters at Sea will soon become operational. The activities of Islamic extremists remain a problem within ASEAN — in particular, Thailand, Malaysia, Indonesia and the Philippines. Weeks before ASEAN Ministers were due to meet in Panglao on the island of Bohol, Abu Sayyaf militants carried out an attack against local police. To safeguard ministers, delegates and officials, the Philippines deployed 26,000 police and soldiers. It is this security issue, together with issues associated with poverty, that should be exercising the minds of Australian policy makers. Several months ago the Australian Foreign Minister, Julie Bishop, claimed that returning ISIS fighters from the Middle East – perhaps up to 600 – would seek to strengthen the militant Islamic presence in the southern Philippines and as part of the process, establish a “caliphate”. The leader of the Philippine terror group, Abu Sayyaf, has recently declared himself an Emir. These militants will not enter the Philippines through airports. They will travel to the southern Philippine Island of Mindanao by boat from Malaysia and/or Indonesia. Recently the spokesperson for Indonesia’s Directorate of Immigration, Agung Sampurno, said that checkpoints at Miangas and Marore Island were unable to effectively screen seaborne movements between Sulawesi and Mindanao. Bishop is right to be concerned and Australia’s intelligence agencies have been working with their counterparts in Indonesia, Malaysia and the Philippines to address the threat — however, more is required. Border protection is more than bullying and terrorising asylum seekers. The best way for Australia to protect its border is through regional co-operation and that should be done through joint naval patrols. Australia has participated in such arrangements in the Gulf. At present, Australia deploys vessels in the region for a variety of tasks including naval exercises and showing the flag. Some express squeamishness at the prospect of co-operation with Duterte in light of his poor human rights record. Any such relationship might not last long. He is said to have pancreatic cancer and. in light of that, to be grooming his daughter, Sara Duterte, to succeed him. She is currently mayor of Davao City, Duterte’s old power base. To be evenhanded, that squeamishness might extend to Malaysia, with its corrupt political system and Indonesia as it buckles to Islamic extremism. As flawed as some of our neighbours may be, that should not override our national self-interest, nor allow us to overlook our own poor human rights record with respect to asylum seekers and corruption within our own major institutions. What is proposed in this article is a permanent Australian patrolling presence in the region to be undertaken in conjunction with Indonesian, Malaysian, Filipino and Singaporean naval assets, and rotational home porting in those countries. Greater and more aggressive naval patrols should aim to deter the flow of arms and fighters between the targeted countries. By engaging in regional maritime security, Australia would also be signalling a broader and deeper interest in the region — no bad thing in the absence of U.S. leadership. Trump and Canadian Prime Minister Trudeau, along with other world leaders, are due to attend a summit of ASEAN leaders in Manila in November. On present form, if Trump attends, he will be a figure with form and without substance — an embarrassment. The chances are he will not attend. Under the circumstances, Australia should be seeking to raise its profile with ASEAN and within the region. Bruce Haigh is a political commentator and retired diplomat, who has recently spent time in the Philippines including Mindanao. You can follow him on Twitter @BruceHaigh2. Get the insights. Subscribe to IA for just $5.